This is my kind of heaven!” said crewmate Barry Worthington as we slid into the bight of Tobago Cays. An ocean of liquid bliss surrounded us, with bands of water in every imaginable shade of blue, framed by a foamy crescent of waves where the coral reef greets the indigo sea. A handful of other boats were moored there, but the islands themselves were noticeably uninhabited with the exception of sea turtles that swam by with soothing regularity. Our trip began in Grenada with a trio of boats chartered by friends from Southwestern and San Diego yacht clubs. In the cool briefing room at Sunsail’s St. George’s base, we poured over charts. White George, a local captain, pointed out the recommended stops, and what to avoid too. Kick ‘em Jenny, a submarine volcano just north of Grenada, had recently been feeling her oats, and he outlined the warning signs of an imminent eruption. 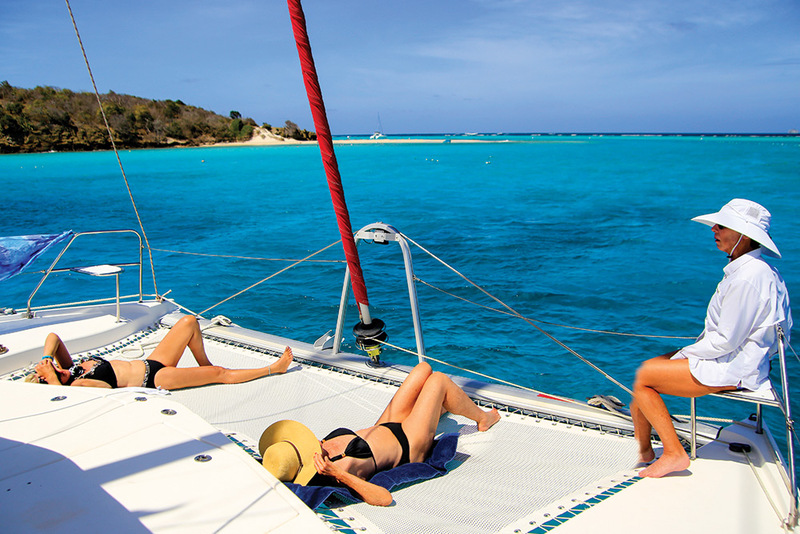 One of many things I like about chartering from Sunsail is the standardization of its fleet. The 444 was a catamaran I’d chartered before, making it familiar and comfortable. With four cabins, and both aft and forward cockpits, there was plenty of room for peaceful seclusion, as well as socializing. The boat was responsive, and the twin 29-horsepower engines provided ample power when we needed it. With our boat checked out, provisioned and tanks topped off, we left early the next morning. Tyrell Bay, on the island of Carriacou, was our destination. Carriacou and Grenada are part of one nation, while St. Vincent and the Grenadines are another. So our comings and goings were timed to coincide with Customs and Immigration office hours. We would check out of Grenada in Tyrell Bay, then into the Grenadines at nearby Clifton Harbor on Union Island, remembering to switch the flags as we changed countries. We slogged up the 17-nautical-mile coast of Grenada. What it lacks in length, it makes up in height, with rugged, volcanic terrain stretching 2,760 feet tall. Bays and fishing villages dotted the western shore of the lush island. By noon we were three-quarters of the way up, slipping past Goyave, one of the leading workboat communities. Eventually the silhouette of Carriacou appeared, and we arrived in Tyrell Bay in the late afternoon. Tyrell Bay is a busy working harbor, in a deep horseshoe-shaped basin. As we anchored, John Bedeau aka “Warrior, the Oyster Man” arrived in a small, scruffy rowboat. He offered mangrove oysters so slender, we wondered if there was any meat inside. But Bob negotiated several dozen for $11, so we mustered the courage to dine off the dirty, dinged-up platter. The oysters were sweet, served with a squeeze of lime and washed down with some box wine we’d purchased in St. George’s. We all survived. It was too late to check out at the C&I office on the south side of the bay. Hours generally are 8 a.m. to 4 p.m. weekdays (shorter on weekends and holidays). But the Lazy Turtle was nearby, so we headed to the colorful open-air restaurant and gobbled up several crisp pizzas in a variety of traditional and island-inspired flavors, baked in an authentic pizza oven imported from Italy. The harbor was bustling all night, and pounding music punctuated the gusts that roared and whistled through the rigging. We set our alarms for anchor watch. The next morning we checked out. Comings and goings in the islands are dictated by C&I hours, but the process was expedited by a notebook of boat documents and instructions from Sunsail, along with several photocopies of our crew list. 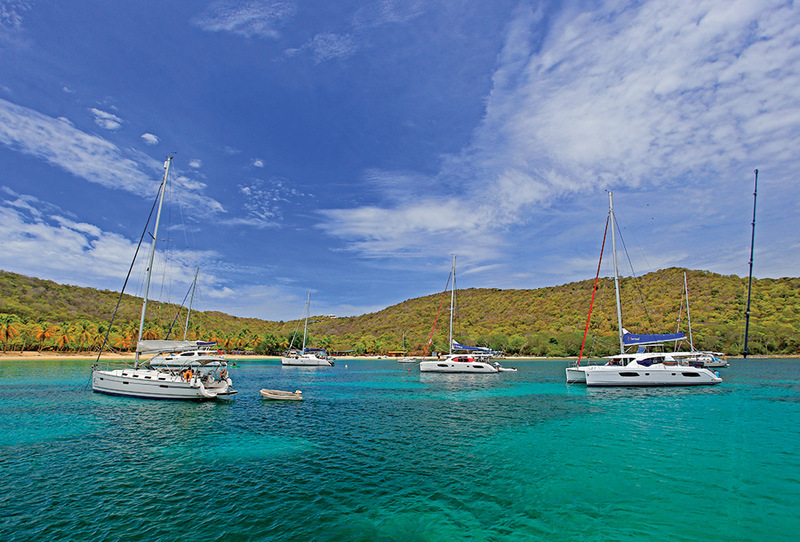 There is a saying, “Heaven can wait,” but we were eager for Tobago Cays. Entering Union Island’s Clifton Harbor, the dockmaster at Anchorage Yacht Club, Alston, remembered our photographer “Reverend Bobby G” from a prior trip, and waved us into an empty slip. This would be a swift stop, before hustling off to paradise to check in and hit the lively market square for fruits and vegetables. On the way back a fisherman sold us a freshly caught tuna. We marinated the fillets in a flood of juices and herbs, and that evening Barry grilled it so spectacularly that he earned himself a new onboard job. Our friends on the other boats stayed in Clifton Harbor for the night, lured by the bars and nightlife, but we were in search of a different kind of nirvana. 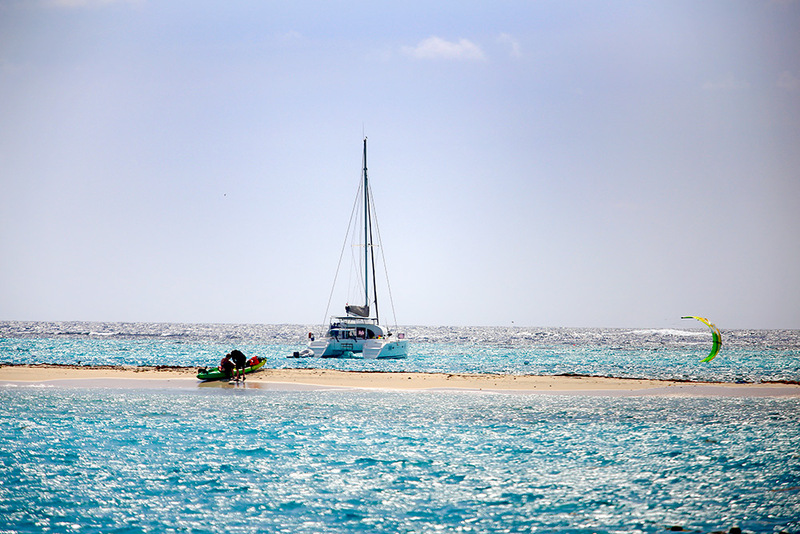 It was just a short 5-nautical-mile jaunt to the Tobago Cays. Approaching from the south, we squeezed past Jamesby Island and navigated the thin water until the expanse of moorings was in sight. As if to welcome us, a turtle floated by. The scene was breathtaking. Striations of blue, in every conceivable hue, laid before us. We perused the anchorage for the idyllic spot. 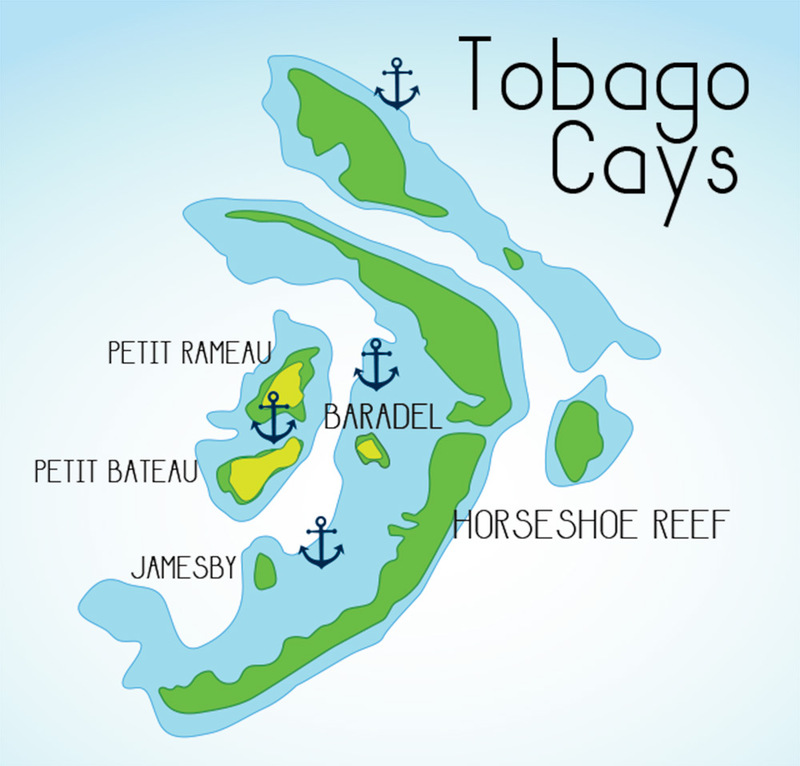 There are several areas to anchor or moor in the Tobago Cays Marine Park—inside the protection of the two-mile-long reef or in the passage between Petit Rameau and Petit Bateau. 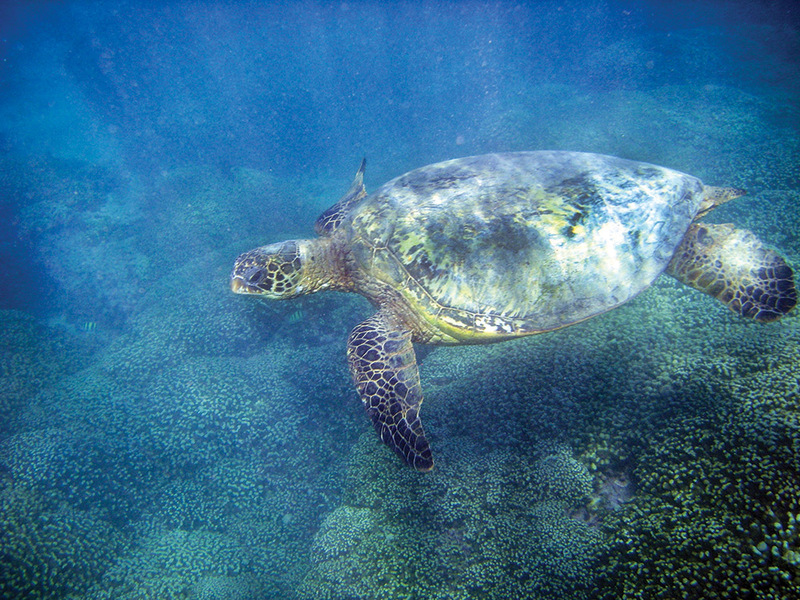 We elected to pick up a mooring near the reef off Baradel Island, closest to the turtle-watching area. As soon as we were secure, we leapt in. The turtle sanctuary is marked by a necklace of white buoys. Boats are restricted, with the exception of cautious dinghies bringing snorkelers in and out, via a marked entryway. But we were so close we could swim over. 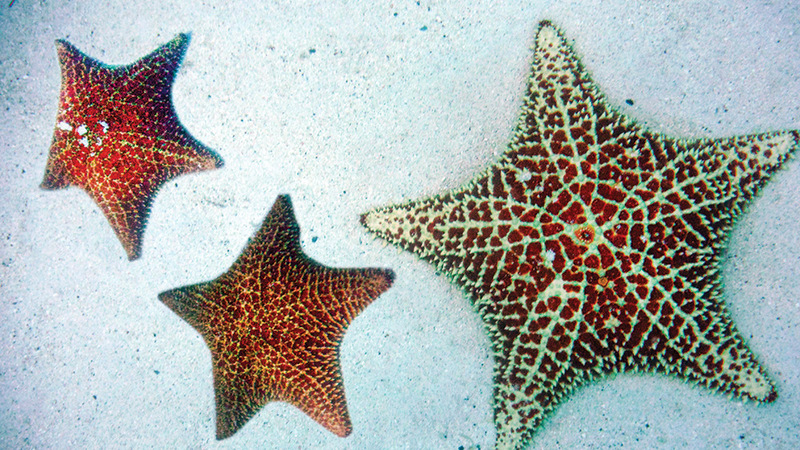 Starfish lined up on the sea floor, like the stars of Hollywood, leading us into the waters of the refuge. Slowly, out of the hazy water, the turtles appeared, shadowy orbs that morphed into these large, prehistoric-looking creatures that soared through the sea on graceful winglike flippers. I could have watched them for hours. Our group ranged in age from our 50s to 80s, but there was no limit on our enjoyment of the Tobago Cays. We all experienced it at our own speed, in our own way. Cathy, a champion swimmer, did laps, while others kayaked, snorkeled and relaxed. We dinghied to the reef, and floated back to the boat with the current, exploring snippets of coral and marine life. On another dinghy ride through the moorings we checked out our neighbors, spying everything from an elegant Wally boat to a double-ender from New York, plus a number of charter boats like ours. 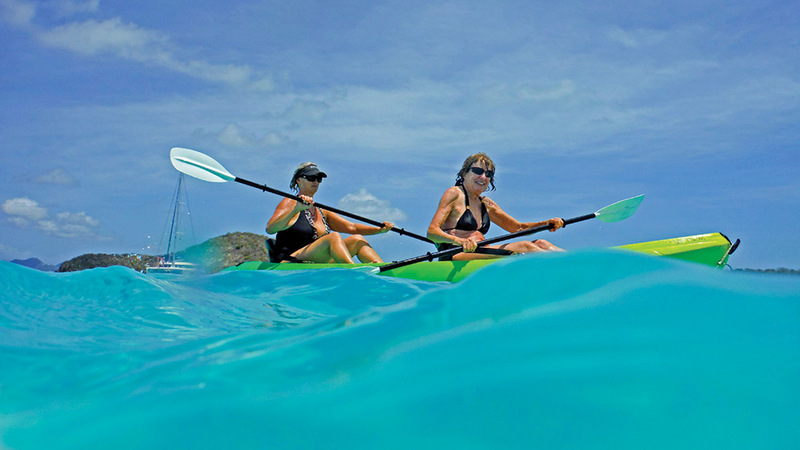 Old, young, families, couples—clearly the heavenly charm of the Tobago Cays has a broad appeal. The rest of our mini-flotilla had rejoined us, multiplying the fun. Meanwhile his wife Kim was awed by the constellations of sea stars, populating the ocean floor. After a couple of days, it was time to think about our return. The flotilla advanced to Salt Whistle Bay on the island of Mayreau, for a dinner at Black Boy’s BBQ and Bar, capped off with rum punches and a moonlit swim in the tepid, crystalline water. From there we reversed our track—Salt Whistle Bay to Clifton Harbor; Clifton Harbor to Tyrell Bay. Blessedly, it was a straight shot down, with the wind on our quarter. From Tyrell Bay we decided to sail to Moliniere, an anchorage just outside of St. George’s. This beautiful spot, on the southwest coast of Grenada, hosts a unique underwater sculpture park – and is less than an hour from the charter base. Once we were out of the lee of Carriacou it was a spectacular sail. The large seas and hefty breeze on the port quarter were no problem for our cat, sporting a modestly furled jib and one reef in the main. Our crew all had their sea legs by now and endured the bracing ride across the open ocean. Kim read, Cathy and Anne played cards. The guys took turns driving in the spirited conditions. With one more night on the boat, we decided to throw the fishing lines out as we approached Isle Ronde. It looked promising, with a chaos of birds swirling over the waters near the rocky promontory. Suddenly, a hit: zzzzzzz! The pole bent and the line snapped. But I had a second line out, with 100-pound test trailing from the stern and we were invincible. 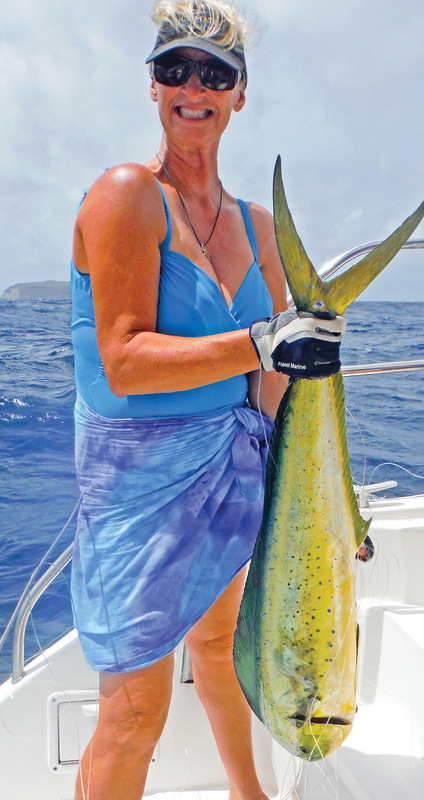 In no time we landed an 18-pound dorado. Peter showed me how to clean the fish, and within the hour we had fresh ceviche served up in the cockpit. We picked up a free mooring at Moliniere, and snorkeled through the unusual assemblage of underwater sculptures. Located just three miles from St. George’s, we could be back at the base well before deadline the next morning. But we had one more night out, enjoying a final evening of camaraderie, alongside generous portions of dorado. “This is such a pleasure, sailing with a group of friends,” Barry said. We had been through a little bit of hell together, but had our heavenly reward, a visit to Tobago Cays.